The perfect way to bring life to your Christmas tree. These carefully screened lights are available either in assembled strings of 12 or 24 clear or mixed color bulbs. 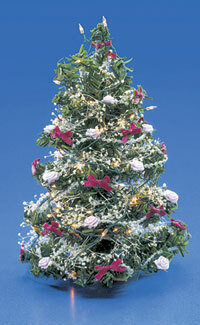 The bulbs are GOR size or smaller to resemble scale-size Christmas tree lights. 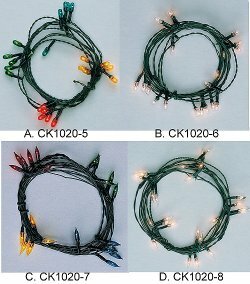 All bulb wires are green to assure a compatible Christmas tree color match. 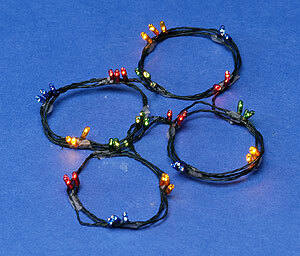 The wired strings are directly interconnected with a continuous unbroken wire between bulbs to eliminate any possibility of an open connection. 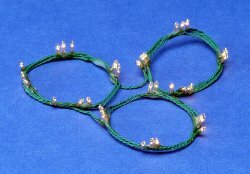 An assembled string of 12 bulbs draws approximately 37 ma and a 24-bulb string approximately 75 ma when connected to a 12-volt source. 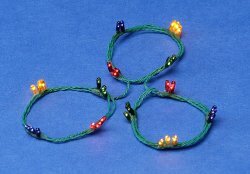 Each bulb measures approximately 3/16" long by 3/32" or less in diameter. All lights, regardless of how purchased, are guaranteed for 5,000 hours of trouble free operation when used with a Cir-Kit Concepts' transformer.